Left or Right of the Color Line? 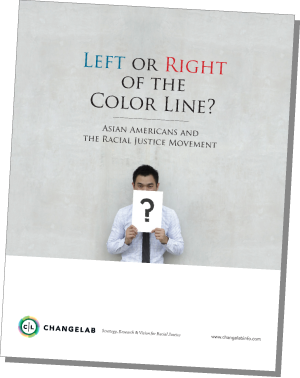 In order to better understand the racial position of Asian Americans, and how Asian American identity functions in the realm of racial politics, ChangeLab conducted in-depth, confidential interviews with 82 Asian American organizers, leaders, intellectuals, and artists working in the racial justice field throughout the United States. We also talked to five non-Asian American racial justice leaders doing promising work that cuts across all communities of color. Our informants represent some of the strongest, most influential racial justice efforts taking place across the country today, including some of the most prominent Asian American organizations. We asked a series of questions about Asian American racial identity, Asian American attitudes toward other people of color, approaches to racial justice work, and gaps and challenges in the field. Following is a summary of our initial findings. This is a time of great racial confusion, with divergent views of what justice means. There is a lack of clarity about what racial justice means in this political moment. The problems of structural racism are dense and vast, yet rather than pushing for transformative change, most efforts today seek to protect the gains of the Civil Rights Movement against rightwing attack. The prevailing framework of liberal multiculturalism limits the political terrain for fighting back to questions of representation. This leaves underlying structural problems unchallenged, or worse, reinforced. In this environment, Asian American organizations face pressure to elbow for political clout in a zero-sum game of racial inclusion. Some argue that advocating for the rights of Asian Americans constitutes a racial justice strategy, regardless of the impact on other communities. Others believe that there can be no justice for Asian Americans without justice for all people of color. Many Asian Americans don’t think about race. The dominant view among our participants is that Asian Americans do not think about race at all. Many attributed this to the racial position of Asian Americans, and to how the political right has manipulated ideas about Asian Americans. There is a belief that in particular, those Asian Americans with class privilege have internalized the model minority myth along with the notion of American individualism. Some noted how harmful this was to Asian Americans who have no resources to identify and address their own experiences of racial discrimination, and no understanding of the roots of anti-Asian hostility. Many participants said that low-wage Asian American workers have the highest level of race consciousness. Asian Americans have internalized a sense of racial superiority. People told us that at the same time that Asian Americans do not think about race generally, they have also internalized a sense of superiority over other people of color, particularly Black people. Interviewees attributed this to structural forces that reinforce pejorative ideas of blackness, and positive ideas of whiteness, along with the prevalence of the model minority myth, which casts Asian Americans as “honorary whites” and encourages a sense of racial pride. Asian American racial attitudes impede solidarity with other people of color. Internalized racial superiority among many Asian Americans hinders efforts to build multiracial solidarity with other people of color. In general, participants said that Asian Americans tend to hold negative ideas of Black people and Latinos, and do not think about Native Americans at all. There was once a strong progressive Asian American movement, but it went off track. Several participants lamented that the term “Asian American” or “API” no longer signifies a set of progressive political ideas as it once did in the ‘60s and ‘70s. The Asian American movement once espoused strong antiracist and anti-imperialist values. However, rapid growth and ethnic diversification post-1965 drove Asian American leaders to prioritize service delivery over movement building, and also led to a set of increasingly diverse political experiences within the Asian American or API coalition. Data disaggregation became the battle cry among Asian American civil rights leaders in order to advocate for the needs of particular ethnic subgroups and to compete successfully for service dollars. While necessary, this left larger issues of social change unaddressed, and deepened divisions between Asian Americans and other people of color. “Asian American” serves less as a political identity than as a demographic category. On the question of Asian American identity, participants expressed concern that the Asian American construct represented an awkward coalition of ethnic subgroups, and not a racial group with shared experiences and political interests. People said that deep disparities in power and access within the Asian American or API coalition created too much fragmentation to allow for meaningful political unity. Particularly since 9/11, certain South Asian and Muslim communities have faced a level of targeting and alienation that has driven them to organize outside of the Asian American or API construct. In addition, many progressive Asian Americans hesitate to identify as Asian American, because of political disagreements with the most dominant expressions of Asian American identity. Various factors contribute to whether people identify as Asian American. Those who do identify as Asian American tend to be younger, later generation, or living in geographic areas where there is no single, dominate Asian ethnic subgroup. Some described how the media and technology served as a way for isolated Asian Americans to find a sense of identification with one another. Racial justice activists believe that organizing around Asian American identity would only be strategic if it were progressive and race-conscious. There is a sense that to the degree that an Asian American consciousness exists, it is not very progressive and not very racialized. People expressed tremendous ambivalence over whether organizing around Asian American identity would be strategic for the racial justice movement. Some feared that it would do more harm than good, because it would reinforce ideas of Asian American exceptionalism. Others said that it would be timely to do so now, because the post-1965 waves of immigration had created new opportunities to forge a strong, progressive, antiracist identity that could push back against the more reactionary tendencies within Asian American communities. Building multiracial solidarity demands deep political education among Asian Americans to counter the structural forces that encourage complicity in white supremacy. There is a need to move away from assimilation and toward a model of power sharing. Participants told us that building a base of Asian Americans who could act as strong allies to other people of color demanded organizing, and political education in particular, to counter mainstream messages about race. Specific examples of such work included organizations working in low-income neighborhoods or with low-wage workers, using storytelling, relationship building, and honest dialogue. There is also a sense that because of how Asian Americans have been racialized, the conscious rejection of relative race privilege would be a powerful refutation of white supremacy.